Radiohead have scored their sixth number one album with A Moon Shaped Pool. 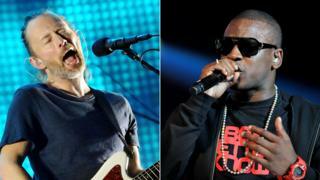 The band's ninth album fended off competition from Skepta, who debuts at number two with Konnichiwa. A Moon Shaped Pool, Radiohead's first album in five years, sold 50,000 copies in the past week, despite only being released on Sunday. Beyonce's Lemonade slides to number three, while last week's number one - Views By Drake - drops to number four. Soul singer Gregory Porter completes the top five, with his new album Take Me To The Alley. Other new entries in the top 20 include Jean Michel Jarre's Electronica 2: The Heart of Noise - which takes eighth place. James Blake's surprise release The Colour in Anything is new at number 13, while Andy Biersack - lead singer of the Black Veil Brides - lands at 16 with The Shadow Side, a solo project released under the name Andy Black. Adele's 25 slips out of the Top 10 for the first time since its release in November, going in at number 12 this week. Notable climbers include Elle King's Love Stuff, which soars 73 places to number 33 after her performance at Sunday's Bafta TV Awards. In the singles chart, Justin Timberlake fails to hit the top spot with Can't Stop The Feeling - the first single from his new album - which debuts at number three. Drake's One Dance remains number one for the fifth week, while Rihanna and Calvin Harris spend a second week at number two with This Is What You Came For. One Dance also passed the 600,000 sales mark this week, certifying it platinum. Both Sia and Mike Posner side one place, to number four and five respectively. New entries further down the chart include Drake & Rihanna's collaboration Too Good, while will.i.am scores his 39th top 50 hit with Boys & Girls feat. Pia Mia landing at number 26.